Weather permitting, the date for our Edgewater Glen Plant Swap is set for May 23rd 2015, 10:00am. Inspired by our Edgewater Glen Garden Walk, Tom Brennan organized the first Edgewater Glen Plant Swap on Sept. 21, 1991 in the park at Greenview & Elmdale. It was so enthusiastically received, that it quickly expanded into a twice-a-year event, spring & fall, and moved to Tom’s plant-filled yard. When Tom had to leave the neighborhood in the late 90s, our neighbors Sue and Kim continued this popular event in the neighborhood. Spring is a great time to divide the perennials you would like to share and meet your gardening neighbors. This year Kim & Sue are particularly interested in distributing any extra Common Milkweed seedlings to help our dwindling Monarch Butterfly populations. Hope to see you there. All gardeners are welcome! 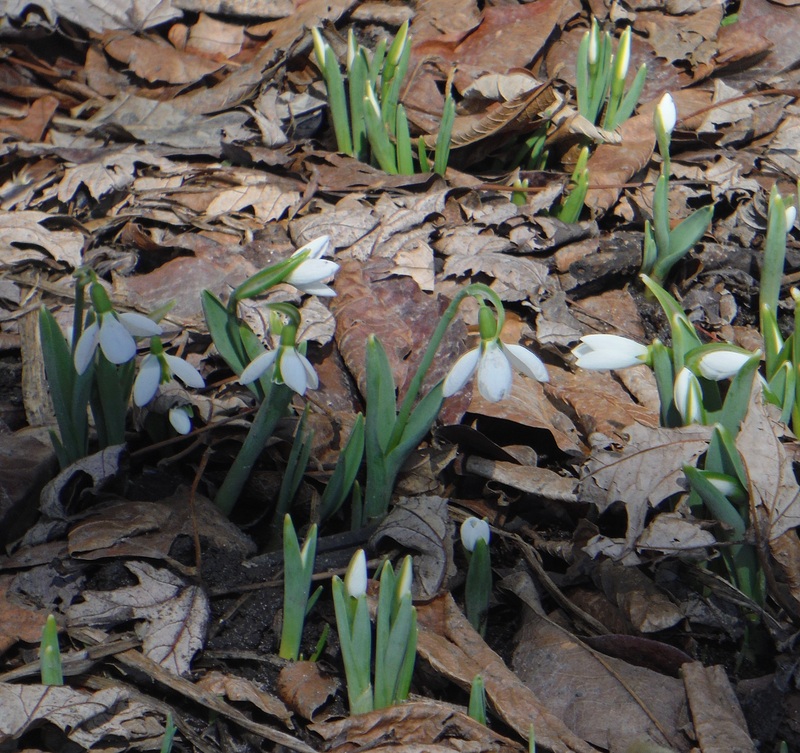 First sighting of snowdrops today on the 1300 block of Norwood! It’s finally spring! This year the neighborhood is featuring the “Gardens of East Edgewater Glen” and will be held on Sunday, July 12, 2015. The ’74 Walk’ went immediately into planning stages and this event has been held annually almost every year since its inception. Pony cart rides, lemonade & hot dog stands, arts & crafts displays, magic show performances, and Glenfest have been some of the additional activities scheduled during this event over the years. If you are a newbie gardener and thinking about giving it a whirl this year, there are a few great videos from LaAmanda Joy over at The Peterson Garden Project below. Happy planting, happy spring! Well this is kind of fun. It looks like our friends over at DNAInfo Chicago followed up on a story about our hidden furry neighbors as well (audio clip embedded below). Keep your eyes peeled! Related posting with video of our furry neighbors: Backyard Front Yard: Edgewater Glen Coyotes? You might get a kick out of this Chicago Tribune article about the neighborhood (from June 15 1986) if you haven’t stumbled upon it yet. Pretty timeless! “Edgewater Glen is a fooler. Sure, it`s a city neighborhood like a lot of others. Its tree-lined streets provide just the right amount of pastoral atmosphere for its sturdy turn-of-the-century houses. It has good schools and shops nearby. And easy access to the lake and plenty of transportation. The facade is an attractive one. But the real Edgewater Glen lies beyond. The real Edgewater Glen is in people`s backyards. Backyard Front Yard: Edgewater Glen Coyotes? Over the years we’ve heard interesting stories from neighbors down in Andersonville about coyote sightings in the area. With the 10 million adorable little bunnies hopping all around Edgewater Glen, it got us wondering… has anyone ever noticed a coyote in the neighborhood? If you are curious about the scientific research going on about urban coyotes in Chicago, have a look at National Geographic’s Downtown Coyotes: Inside the Secret Lives of Chicago’s Predator or On the Loose: Urban Coyotes Thrive in North American Cities. There is some especially cool Chicago coyote footage (from the coyote’s perspective) of them looking both ways before crossing the street with their maracas in the National Geographic Crittercam video. Well folks… it is starting to be that time of year again. It sure would be fun to see a bunch of yellow tulips sprouting all over the neighborhood next spring. Curious about urban chicken keeping? This is your chance to take a peak at the wide variety of chicken coops and breeds in the Chicago area at the 5th Annual Windy City Coop Tour on September 20 – 21 from 10 AM to 2 PM each day. It looks like there are a few of our Edgewater neighbors on the route. Backyard Front Yard: Edgewater Glen Fall Plant Swap! “The Edgewater Glen Fall Plant Swap will be held Sat. Sept. 20, 2014 from 10am til noon, weather permitting, in the back yard at 1420 W. Glenlake (6100N). Fall is a great time to divide treasures like iris’ and other perennials or plant materials that you’d like to share along with excess gardening paraphernalia. Even if you don’t have anything to share, we usually have lots of things that need a home. Come & meet your gardening neighbors. All Edgewater residents are welcome.